The largest claim in processor Realme U1 teaser Selfie shots-Realme's next smartphone, Realme U1, is to be launched on November 28. Reality has already revealed that Realme U1 will be equipped with the Helio P70 processor and it is a selfie-centric smartphone. Apart from this there is no other information available about specification. But the company is not missing out on the opportunity to create an environment in favor of its latest Handset Realme U1. Given the market challenges, the company has now made a big claim about its processor. Realme claimed a tweet that Hilio P70 processor, Realme U1, is more powerful than the Snapdragon 636 and Highslicion Kirin 710 processor. Scores of Antuu Benchmark Test scores have also been shared in the tweet to suppress this claim. Assuming that, in the AnTuTu Benchmark V7 test, the highest 145021 points were compared to the rest of the processor. Snapdragon 636 processor acquired 115611 points and Kirin 710 processor has 139974 points. In the price segment of Rs 15,000, the handsets like Xiaomi Redmi Note 6 Pro, Nokia 6.1 Plus, Motorola One Power, Asus Zenfone Max Pro M1 and Redmi Note 5 Pro come with snapdragon 636 processors. At the same time, phones like Honor 8X and Huawei Nova 3i come with Kirin 710 processors. Realme U1 is going to get the challenge from the same handset. This is probably the reason that the company has made the benchmark score public to tell its phones more powerful just before the launch. The largest claim in processor Realme U1 teaser Selfie shots-The multi-core APP AG-AI process is also part of the phone with the Hilio P70 processor in the handset. This processor is based on MediaTek's Neuropilot Program which is designed for better Artificial Intelligence. Realme has also shared some selfie shots taken from his Realme U1 handset. This smartphone has been talked about having 296 face recognition points, which will bring superior selfie portraits. 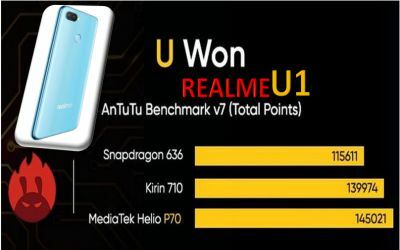 It is worth noting that the real performance of the Helio P70 will be done only after the launch of Realme U1. Pictures leaked from Realme U1 also came to know that it will come with WaterDrop display and two rear cameras. It has also been claimed to be the world's most powerful selfie camera. There is currently no information available about Price of Realme U1 and other specification. However, it is set to be launched on November 28 and sold on Amazon India.